After you've cleaned your face, and your pores, you're ready for the finishing touch. Yes, this moisturizer, but it also has acne-fighting medicine in it, so go easy. Apply a thin layer over the affect area. Do this once a day for the first few days, then gradually increase to 2-3 times a day if needed or recommended by your doctor. But be smart. If your skin starts to dry out or peel, reduce your use to once a day, or even every other day. - Rinse right away with water if it gets in eyes. i brought this product from Meijer's yesterday and it’s already irritating and burning my skin. yesterday night, was my first night using the prouduct and about 30 minutes later it starting making my face feel itchy! i tried using it again this morning, followed by my routine using benzoyl peroxide acne wash and gel. but on my way to school, about 30 minutes later, my pimples started turning red and it burned a lot!! i washed my face again tonight and used it just to make sure it was THIS PRODUCT irritating my face and it is. i’m even experiencing new breakouts.. almost like red bumpy rashes on my cheekbones! Hi there, thanks for sharing your review with us! We're so sorry to hear you had this reaction after using our Dual Action Moisturizer. We'd like to chat more and see how we can help, so please give us a call at ​1-877-754-6411. You can reach us Monday-Friday from 9a-5:30p ET. Hope to hear from you soon! Es excelente los tres pasos acabaron con el acné y la sensación fresca y humectada es genial aún después del maquillaje, recomiendo los tres pasos pues me ha dado muy buen resultado. I first found out about this product through my sister. Once I tried it out, it made my breakout calm down and I started to see a difference. This product was a instant need in my skincare routine and I recommend it for every skin type as this product works wonders. 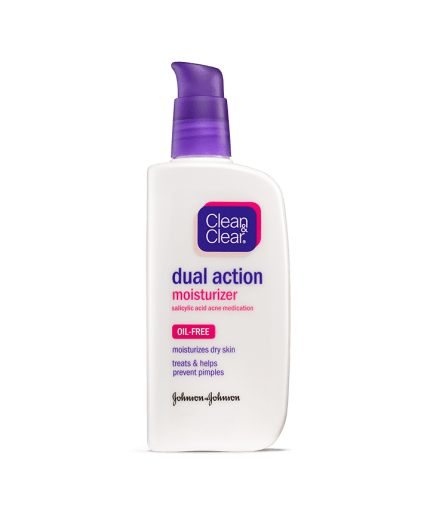 I’ve been using the clean and clear morning burst facial cleanser for years and I was wanting to find a good moisturizer to help with my dry skin so I bought the dual action moisturizer thinking it would work for my skin and NOPE. I had more breakouts with using this product within a few days and I would not recommend this product. We're sorry to hear this and want to help. Give us a call at 1-877-754-6411. We're available Monday-Friday 9AM-5:30PM ET. When you call mention your username to our team. We hope to speak with you soon! i love this honestly ,one of the best things to have been made , its smooth and it works Instantly , it doesn't dry out skin like some products did. i love this i would never replace this! Be VARY careful with this. The first time I used this I had a slight tingling/burning that I ignored and I used it again the next night... I had to stop using it because now my face is so burned and irritated that I can’t even put water on my face. The only thing my skin is taking right now is vasilne. I’m so frustrated and in pain and mind you I have NEVER had sensitive skin before. I know it’s this product forsure because I only applied in my t zone and this is exactly where I’m in pain. I just want it to go away! We're sorry to hear this happened to you! We'd like to speak with you more about your experience. Please give us a call Monday-Friday 9am-5:30pm at 877-754-6411. We look forward to hearing from you. Is this product safe for use while pregnant?? I have used this product before and it was good. However, ild like to know if it’s safe to use while pregnant?? That's great to hear, Vany! The safety of you and your family is always a top priority and we want to make sure you get the best info possible. Because this product hasn't been tested specifically for use during pregnancy, we always recommend talking to your doctor about any concerns you may have first. As medical professionals, they will have the best answers for you and your child. Thanks again, we hope you have a wonderful weekend!